Hollycroft Software Ltd was founded by Roy Armstrong I Eng. MIIE in 1998. Today, we help hundreds of contractors produce professional looking office documentation fast. The software is a culmination of over on-going development by the Hollycroft team and the input of the hundreds of contractors using our software. 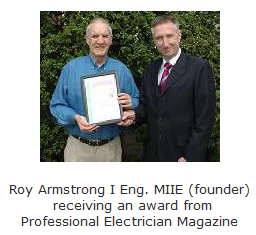 We have received many accolades including gaining the prestigious top product award in the Professional Electrician and Installer magazine. “I would like to highly commend your electrical software package.